This paper presents evidence on the impact of hours spent on housework activities on individuals’ wages for Germany using data from both the German Socio-Economic Panel and the German Time Use Survey. In contrast to most of the international literature, we find no negative effect of housework on wages. This holds for men and women, for married and single individuals, and for part-time and full-time workers both in West and East Germany. Our insights do not change when we distinguish different types of housework activities or address the endogeneity of housework in our wage regressions by using instrumental variables estimators. Auf Grundlage zweier deutscher Datensätze, des Sozio-oekonomischen Panels und der Zeitbudgeterhebung, untersucht dieser Beitrag den Einfluss der für Hausarbeit aufgewandten Zeit auf die Löhne. Im Gegensatz zum Gros der internationalen Forschungsliteratur findet sich kein negativer Effekt der Hausarbeit auf die Löhne. Dieses Ergebnis zeigt sich in West- wie Ostdeutschland sowohl für Frauen und Männer, für verheiratete Individuen und Singles als auch für Teilzeit- und Vollzeitbeschäftigte. Unsere Ergebnisse ändern sich zudem nicht, wenn wir verschiedene Formen von Hausarbeit unterscheiden oder die Endogenität der geleisteten Hausarbeit in den Lohnregressionen mithilfe von Instrumentvariablenschätzungen berücksichtigen. It is well known that women are more engaged in housework activities than men (e.g., Burda et al. 2008; Maani and Cruickshank 2010) and that there is also a considerable gender pay gap with women earning significantly less than men (e.g., Altonji and Blank 1999; Weichselbaumer and Winter-Ebmer 2005). It is, however, less known how the amount of time spent on housework activities affects workers’ wages. If housework has a negative impact on wages, the gender difference in time spent on housework activities may contribute to explaining the gender pay gap. There is a growing empirical literature documenting that hours spent on housework activities adversely affect workers’ wages which also finds the effect to be more pronounced for women than for men and to differ according to marital status. More recent contributions also report a different impact of housework on wages for part-time and full-time workers and that the effect varies for different types of housework activities and is particularly strong for daily routine housework (for a recent survey of the literature, see Maani and Cruickshank 2010). While there has been considerable research on the impact of housework on wages using U.S. data, some studies have also looked at other Anglo-Saxon countries, such as the UK, Australia, and Canada. Yet, to our knowledge only three studies exist for continental European economies that differ much in their labour market institutions compared to Anglo-Saxon economies. Moreover, in continental European countries like Italy or Germany women show a much lower labour market attachment and thus the housework–wage relationship may differ here, too. What is more, the German case seems to be of particular interest given the persistent differences between the East and the West German labour markets: While labour market participation of East German women is found to be significantly higher than for West German women (e.g., Hanel and Riphahn 2011), there is also ample evidence that the gender pay gap is lower in East Germany (e.g., Hunt 2002; Maier 2007). What is more, there is evidence that (1) East German women value employment considerably higher and commit themselves more to paid work than West German women (Adler and Brayfield 1997), (2) part-time work is less widespread and accepted and time allocation to household activities is less gendered in East than in West Germany (Bauer et al. 1996), and (3) prejudices against female employment are less pronounced among East Germans (Lee et al. 2007). These observations seem to still reflect to some extent the entirely different policies with respect to female employment in the former German Democratic Republic and the Federal Republic of Germany documented in Bauer et al. (1996). Given these profound differences, investigating the effect of housework on wages separately for East and West Germany may also shed some light on the different gender pay gaps in both parts of Germany. The current paper is intended to add to the literature by systematically investigating the effect of time spent on housework on individuals’ wages for Germany making use of two different data sources: the German Socio-Economic Panel (GSOEP) and the German Time Use Survey (GTUS). By using two different data sets, by investigating the effect of housework on wages for part-time and full-time working as well as married and single individuals, and by providing separate estimates for East and West Germany, we improve in several ways on earlier work by Anger and Kottwitz (2009) who use GSEOP data and constrain their analysis to full-time working, married individuals and who also pool West and East German observations. In contrast to Anger and Kottwitz (2009) and most of the international literature, running FE (where possible) or OLS wage regressions we find no significant (neither in the economic nor in the statistical sense), adverse effect of housework on individuals’ wages for any of the subgroups considered. This also does not change when instrumenting housework in the wage regressions to alleviate endogeneity concerns. Since endogeneity of housework in the wage regression is likely to bias the coefficient of housework downwards, we conclude that we find robust evidence against a negative impact of housework on wages for German workers. The remainder of this paper is organised as follows: Sect. 2 reviews the existing theoretical and empirical literature on the housework–wage nexus and derives our hypotheses. Section 3 presents our econometric specification. Our data are described in Sect. 4. Section 5 presents and discusses the results of our econometric analysis, and Sect. 6 concludes. There are at least two reasons why we should expect a negative relationship between wages and the time spent on housework activities. On the one hand, Becker (1985) argues that housework activities are more demanding than leisure and other non-market activities, so that individuals engaged in housework may spend less effort on market activities and thus earn lower wages. Furthermore, housework may interfere with market work and thus lower productivity because it may, for instance, limit individuals’ possibilities to engage in network activities after work, to stay at work late to complete projects, or to attend training courses (e.g., Bonke et al. 2005). On the other hand, individuals with more housework responsibilities may select themselves into jobs offering more flexible working arrangements (such as flexible working hours) that result in negative compensating wage differentials or into jobs or occupations that are less demanding and for this reason pay lower wages. The existing empirical literature has investigated the impact of housework on wages predominantly using U.S. data (e.g., Coverman 1983; Hersch 1991a, 1991b; Hersch and Stratton 1997, 2002; McLennan 2000; Keith and Malone 2005; Hersch 2009) and generally finds a significantly negative effect of the hours spent on housework on wages, the only exception being the study by McLennan (2000). This even holds after controlling for sectors and occupations, thereby accounting for possible negative compensating differentials. Additional studies by McAllister (1990), Phipps et al. (2001), Bonke et al. (2005), and Bryan and Sevilla-Sanz (2010) use data from Australia, Canada, Denmark, and the UK, respectively, and arrive at similar conclusions as the U.S. studies.1 The same holds for Anger and Kottwitz (2009) using survey data from the German Socio-Economic Panel. One notable exception is the study by Engelhardt and Jann (2004) for Switzerland who are able to directly investigate the relationship between the time spent on housework activities, worker effort, and wages. Although the study finds that wages increase in workers’ motivation at the job, it also documents that motivation is not adversely affected by the time spent on housework activities, thereby casting some doubt on Becker’s (1985) effort story as one of the main arguments to expect a negative wage–housework relationship. The main empirical problem when investigating the impact of housework on wages is the potential endogeneity of hours spent on housework in the wage equation. Most evidently, reversed causality may be at work: Since individuals with higher wages have higher opportunity costs of housework activities, high-wage individuals may decide to reduce their time spent on housework, e.g., by substituting market purchases for home production (Hersch and Stratton 1997).2 Additionally, endogeneity may stem from unobserved heterogeneity: For instance, individuals with higher innate abilities may be more likely to specialise in market work and thus less likely to engage in housework activities (Bryan and Sevilla-Sanz 2010). Failing to account for any of these sources of endogeneity would yield a downward-biased coefficient of hours spent on housework in wage regressions and could therefore even result in a spurious negative effect of housework on wages. To address endogeneity problems, the literature has applied both fixed-effects (FE) and instrumental-variables (IV) estimators, where instruments used include the characteristics of other household members or information on the type and ownership of residence (cf. Maani and Cruickshank 2010). While typically the significantly negative impact of housework on wages also shows up in FE wage regressions, studies using IV techniques usually find that time spent on housework is exogenous, so that instrumenting housework is not necessary at all (e.g., Hersch and Stratton 1997; Bryan and Sevilla-Sanz 2010). One notable exception is the study by McLennan (2000) who finds no effect of housework on wages once the endogeneity of time spent on housework activities is accounted for. Most empirical studies also document heterogeneous effects of housework on wages depending on gender, marital status, and working hours. Usually, women suffer higher wage losses from housework activities than men, and some studies also report higher wage losses for married as opposed to single women (e.g., Hersch and Stratton 2002; Bryan and Sevilla-Sanz 2010). As Hersch and Stratton (2002) argue, the latter result may reflect more severe constraints on the division and timing of housework activities for married individuals that are more likely to interfere with labour market activities. For instance, Alesina et al. (2011) show that intra-household bargaining may yield a situation in which married men put more effort on their careers and engage less in household production than single men and married women if there is a gender pay gap, implying comparative advantages of men in market activities, or if men possess more bargaining power due to cultural or historical reasons. Since for historical reasons female employment has been and still is more widespread (Hanel and Riphahn 2011) and accepted (Lee et al. 2007) in East Germany, one should therefore expect housework activities to be less gendered in East than in West Germany and females to be more committed to employment, which is indeed found (see Bauer et al. 1996, Adler and Brayfield 1997, and our own findings below in Sect. 4). Moreover, Bryan and Sevilla-Sanz (2010) argue that part-time work may be more compatible with housework activities, so that housework should have less an impact on wages of part-time workers. In line with this argument, they find that there is a negative impact of housework on married women’s wages only if they work full-time hours. As there is some evidence, that part-time work among females is less common and accepted among women in East Germany (e.g., Bauer et al. 1996) housework activities arguably interfere more with market work for East compared to West German women, so that one may expect a more adverse effect of housework on wages for East German women. Finally, some papers investigate whether the impact of housework is the same for different housework tasks. For instance, Hersch and Stratton (2002) group housework tasks into three categories of housework: “typically female” tasks include cooking, cleaning, laundry, and shopping, “typically male” tasks consist of outdoor, maintenance, and repair activities, and “neutral” tasks include doing bills and driving other household members. Including the hours spent on these different categories of housework activities in FE wage regressions they find that the negative effect of housework on women’s wages is mainly driven by the more pronounced negative impact of “typically female” housework on wages. As an explanation of their finding, Hersch and Stratton argue that these housework tasks are more likely to interfere with market work as they are routine daily activities that usually cannot be postponed. In a similar vein, Hersch (2009) reports that only “daily housework”, such as cleaning, laundry, and meal preparation, has a significantly negative effect on wages, whereas other categories of housework do not adversely affect wages. We expect the time spent on housework activities to have a negative impact on wages because it constrains workers’ effort dedicated to market activities and flexibility, but less an impact for part-time workers who should find it easier to juggle market work and housework activities. Following the empirical findings in the literature, we suspect the impact of housework on wages to differ for men and women, with women suffering higher wage losses due to housework activities than men. Furthermore, we expect the effect to differ according to marital status as married individuals may be less flexible in the division and timing of housework activities. Given the profound differences between women’s labour market behaviour in East and West Germany, we expect time spent on housework to interfere more with market work for East than for West German women and thus a stronger effect of housework on wages for East German women. Since different housework tasks are likely to differ in their interference with on-the-job performance, we also suspect that routine tasks on a daily basis like cooking, shopping, and laundry have a stronger adverse effect on wages than other tasks. where lnw it is the log hourly wage of individual i in period t, x it a vector of control variables, hw it hours spent on housework per week (on weekdays), pt it a dummy for part-time work (i.e. less than 30 hours a week), hw it pt it the interaction term of these, v i a person fixed effect, and u it the idiosyncratic error component. Our first hypothesis concerns the marginal effect of housework on average wages. The effect for full-time workers γ 1 is expected to be negative, while the interaction effect with part-time work γ 3 should be positive if part-time workers are more flexible when engaging in housework activities.3 To test our second hypothesis of different effects of housework (and other covariates) by gender and marital status, we run separate regressions for men and women as well as for singles and married individuals. We expect the marginal effect of housework to be more pronounced for women and especially for married women as these may be less flexible.4 To test our third hypothesis of different housework effects for West German and East German women, we run all these regressions separately for West and East Germany. Eventually, we test our fourth hypothesis of different effects for different categories of housework activities in a way following Hersch and Stratton (2002) and Hersch (2009) by including more disaggregated measures of housework in the wage regressions. We distinguish categories of housework that are performed on a routine daily basis and other types of housework that are easier to be postponed. The vector of control variables x it includes standard measures of human capital endowments, i.e. years of schooling, labour market experience (linearly and squared), and job tenure (linearly and squared), the number of children in the household, the spouse’s employment status (if present), a dummy for a temporary contract, and a set of dummies for the federal state the individual is living in.5 Moreover, we include a set of dummies for firm size and (one-digit) industry. As we discussed in Sect. 2, individuals spending more time on housework may select themselves into less demanding jobs or jobs with more flexible working conditions and thus negative compensating wage differentials. To control for this sort of selection, we further include a dummy for flexible working hours and a set of dummies for the (one-digit) occupation. To arrive at reliable effects of hours spent on housework on wages, it is crucial to control for time-invariant unobserved heterogeneity. Otherwise, the estimated marginal effect of housework is likely to be biased downwards due to innate ability differences of individuals—with more able individuals being more career-oriented and thus more likely to earn higher wages and less likely to spend many hours on housework. This is achieved by including the fixed effect v i . For our empirical analysis we use data from two different sources: We utilise ten waves of the German Socio-Economic Panel (GSOEP) comprising the years 2000–2009 and data from the 2001/2002 German Time Use Survey. The GSOEP is a representative longitudinal survey administered by the German Institute for Economic Research (DIW Berlin) covering about 11,000 households and more than 20,000 individuals. It contains detailed yearly information on individuals’ socio-demographic characteristics, labour market experience, gross wages, working hours, and household structure.7 Furthermore, in every wave, household members were asked about the number of hours they spent on five different housework activities on a typical working day (i.e. Monday to Friday). The housework activities included are “errands (shopping, trips to government agencies, etc. )”, “housework (washing, cooking, cleaning)”, “childcare”, “care and support for persons in need of care”, and “repairs on and around the house, car repairs, garden work”. Together with the wage data included we can use this information to analyse the impact of time spent on housework activities on hourly gross wages (deflated by the 2005 consumer price index). Our second data set is the 2001/2002 German Time Use Survey (GTUS) provided by the German Federal Statistical Office. In addition to information on individuals’ socio-demographic characteristics, net wages, and working hours, it contains detailed time diaries with precise information on individuals’ time allocation (distinguishing 272 possible activities) over a typical working day in ten minutes intervals.8 Thus, the main advantage of the GTUS over the GSOEP is the more precise and detailed information on individuals’ time spent on different housework activities. That said, its main disadvantages compared to the GSOEP are two: Firstly, it is only a cross-sectional data set and thus does not allow us to run FE wage regressions and, secondly, monthly net wages included are interval-censored with intervals’ width being €100, thereby adding noise to our dependent variable. Our samples comprise individuals aged 16–60 years who are working full-time or part-time (i.e. 30 hours a week or less). We exclude apprentices, individuals on military or civilian national service, and self-employed workers. To eliminate potential outliers in the GSOEP data, we further exclude the top and bottom one per cent of observations with respect to hourly gross wages and the top five per cent of observations with respect to hours spent on housework.9 After dropping observations with missing covariates our samples comprise 61,396 observations (34,669 for men and 26,727 for women) for the GSOEP data and 2,876 observations (1,483 for men and 1,393 for women) for the GTUS data. Table 1 presents summary statistics for hours spent on housework activities and hourly log wages for men and women separately for East and West Germany and separately by marital status using our GSOEP sample. Singles are defined as individuals without a partner, while married individuals comprise all individuals who live with a spouse or partner in the same household.10 Regarding total hours spent on housework, we find that women dedicate much more time to housework activities than men. Married West German (East German) women spend about 22.0 (21.2) hours a week on housework, whereas married West German (East German) men allocate only 13.8 (15.4) hours per week to housework activities. On the other hand, single individuals devote considerably less time on housework. While there is also a clear gender difference in time spent on housework for singles, this difference is less pronounced compared to married individuals: West German (East German) single women spend 14.5 (16.5) hours a week on housework, whereas West German (East German) single men have 11.2 (13.4) hours of housework per week. Disaggregating total hours on housework into five categories, we find that women (both married women and singles) predominantly spend time on housework activities such as cooking, cleaning, and laundry, whereas married men spend more of their housework time on maintenance and repair activities. This is in line with Hersch and Stratton (2002) and Hersch (2009) who report considerable gendering of different housework tasks, with daily routine activities such as cooking, cleaning, and laundry being “typically female” activities as opposed to “typically male” activities such as maintenance and repair. Furthermore, Table 1 documents gender pay gaps for all groups that are considerably more pronounced in West Germany and for married individuals. In West Germany, married women’s hourly gross wages are 28 log points lower than men’s on average, while the difference in East Germany only amounts to 8 log points. For singles gender pay gaps both in East and West Germany are considerably lower: Single women’s average hourly gross wages in West Germany are 10 log points lower than single men’s, whereas the difference is just 3 log points in East Germany. Consequently, those women with highest hours spent on housework suffer the largest earning differentials relative to men. Related to this, we find a negative correlation between hours spent on housework and wages of −0.166 that is also more pronounced for the subsample of women than for the subsample of men. For additional descriptive information on our GSOEP sample, see Table 7 in Appendix. Table 2 presents the same descriptive statistics as in Table 1 for our GTUS sample. While the overall results of Table 1 are also found with the more precise time use data (i.e. women spent much more time on housework activities and in particular on routine activities than men, and there are considerable differences by marital status), gender differences in hours spent on housework activities are even a little more pronounced in this data set. Gender pay gaps in the GTUS sample differ considerably more between West and East Germany. In West Germany married women’s hourly net wages are 35 log points lower than men’s on average, while the difference in only 13 log points in East Germany. For single women we observe 13 log points lower average net wages than for men in West Germany and 11 log points lower average net wages in East Germany. Other than in the GSOEP sample, those women with highest hours spent on housework do not generally suffer the largest earning differentials relative to men. Interestingly, the correlation between hours spent on housework and wages is zero (−0.012) and does not differ between the subsamples of women and men. For additional descriptive information on our GTUS sample, see Table 8 in Appendix. We now turn to our regression results. Table 3 reports FE wage regressions on our GSOEP sample separately by gender and marital status for West and East German observations including the total number of hours spent on housework activities and the interaction term with part-time work as main regressors of interest.11 For West Germany the effect of housework on full-time workers’ wages is small and insignificant for all groups with the exception of married females for whom there is a small positive effect that is significant at the 10 per cent level. Moreover, the interaction effect of housework and part-time work is insignificant in all cases. We therefore find no support for our first hypothesis of a negative effect of housework activities on wages that is less pronounced for part-time workers. Furthermore, no clear differences according to gender and marital status show up, and thus there is no support for our second hypothesis. For East Germany the results are a little more mixed. The effect of housework on full-time workers’ wages is negative but insignificant in all cases with the exception of married women for whom the wage decreases by 0.12 per cent for every additional hour spent on housework (significant at the 5 per cent level). Since in East Germany full-time working married women spend 21.2 hours to housework activities on average (see Table 1), the total effect of housework would account to roughly 2.5 per cent lower wages in total and therefore is rather small from an economic point of view. Furthermore, the interaction effect of housework with part-time work is significantly positive at the 5 per cent level, so that part-time working married women experience no wage losses from housework. Nevertheless, overall differences in the effect of housework on wages between West and East Germany are only minor, and thus there is little evidence corroborating our third hypothesis. Turning to our GTUS sample, we unfortunately cannot fit FE wage regressions as the data come from a single cross section only but have to rely on simple OLS wage regressions, the results of which are reported in Table 4. Although one should expect the coefficient of hours spent on housework activities to be biased downwards due to either unobserved permanent heterogeneity or reversed causality (see our earlier discussion in Sects. 2 and 3), our results find no significantly negative effect of housework on wages for both full-time and part-time men and women living in either East or West Germany, be they married or not. Thus, the GTUS data do not give any support to our first three hypotheses. To test our fourth hypothesis that daily routine housework activities have a stronger negative impact on wages as opposed to those activities that are more easily postponed, we distinguish two categories of housework. As hours spent on daily routine housework activities we define the sum of hours spent on “shopping”, “washing, cooking, and cleaning”, “childcare”, and “care and support for persons in need of care”, whereas the hours spent on repair and maintenance activities form the second category.13 As can be seen from Table 6, no clear patterns show up. Starting with the GSOEP sample, only for full-time working married women in East Germany there is a significantly negative impact of “routine housework activities”. Although the effect of repair and maintenance activities is even more pronounced for this group, it is imprecisely estimated and thus statistically insignificant. Similar to overall hours spent on housework, these negative effects are absent for part-time working women in East Germany. On the other hand, for part-time working married men in East Germany both categories of housework have a significantly positive impact. In West Germany, full-time working married women even experience a positive and significant effect of “routine housework activities” on wages. Similar results show up for the GTUS sample, but again no single type of housework activities has a significantly negative impact on workers’ wages both in West and East Germany—independently of gender and marital status. That said, there seems to be no clear evidence in line with our fourth hypothesis that the effect of “routine housework” on wages is more negative that the effect of other housework activities. Overall, we conclude that there is (almost) no evidence for any of our four hypotheses. Apart from married women in our East German GSOEP sample, for whom we find negative effects of time spent on housework on wages when working full-time hours and no effect when working part-time hours, our results do not indicate any clear effect of housework on wage. What is more, additional robustness checks reported in footnote 12 indicate that this effect disappears once accounting for sample selection and should thus not be overinterpreted. In this paper, we have investigated the impact of time spent on housework activities on individuals’ wages for Germany using two different data sets, the German Socio-Economic Panel and the German Time Use Survey. Following the existing theoretical and empirical literature, we expected the effect to be negative as housework activities are likely to constrain workers’ effort dedicated to market activities and flexibility. Furthermore, we tested whether the impact of housework on wages is different according to gender, marital status, different types of housework activities and whether it differs for West and East Germany. Applying fixed-effects (where possible) and instrumental-variables techniques to address problems of reversed causality and unobserved heterogeneity in our wage regressions, we find no evidence that wages are adversely affected by hours spent on housework activities for both data sets. This holds both for men and women, for married and single individuals, as well as for part-time and full-time workers both in West and East Germany. By using two independent data sets for Germany, we follow Hamermesh (2000, p. 376) in arguing that “the credibility of a new finding that is based on carefully analysing two data sets is far more than twice that of a result based only on one”. Our results are in contrast to a growing international empirical literature, recently reviewed by Maani and Cruickshank (2010), that documents a clear adverse effect of housework on wages and that points at the gendered nature of housework with women spending much more time on housework activities than men (especially when being married) as one possible explanation of the gender pay gap. In particular, we arrive at different conclusions than the only other study using German data by Anger and Kottwitz (2009) who report large, adverse effects of housework on wages for both men and women, but who constrain their analysis to full-time working, married individuals and also pool East and West German observations in their GSOEP sample. In contrast, we make use of a second data set, the German Time Use Survey, to assess the robustness of our results and also apply instrumental-variables estimators to check whether our results suffer from endogeneity problems in the extent of housework activities. What is more, Anger and Kottwitz (2009) do not control for flexible working arrangements likely to be positively correlated with hours spent on housework activities and also likely to yield negative compensating wage differentials, thereby adding downward bias to their housework coefficient, whereas we control for flexible working hours arrangements. Our results do not find any systematic heterogeneity in the effect of housework on wages for subgroups of workers documented in earlier studies. Interestingly, the absence of a negative impact of housework on wages is not driven by our attempts to address endogeneity concerns (such as in the study by McLennan 2000, who does not find an impact of housework on wages once correcting for the endogeneity of time spent on housework), but also holds in standard OLS or FE wage regressions, where there are good reasons to think the coefficient of housework to be biased downwards. From this we conclude that housework does not adversely affect wages in Germany. As a consequence, gender differences in the time spent on housework activities cannot contribute to the explanation of the persistent empirical regularity of the gender pay gap in Germany. Note that the existent literature has used comparable data sources and methods to arrive at its conclusions (e.g., longitudinal survey data, instrumental variables estimators, and, to a lesser extent, time use data), so that we do not think that different findings are due to methodological differences. In our eyes, the main difference is rather that existing studies documenting a negative impact of housework on wages has almost exclusively relied on data from Anglo-Saxon economies. Interestingly, in another study for a continental European country, viz. Switzerland, which investigates the relationship between housework activities, motivation at the job, and wages, Engelhardt and Jann (2004) find that housework activities do not adversely affect workers’ motivation, thereby casting doubt on the effort story suggesting a negative effect of housework on wages. Hence, we think it would be promising to investigate whether other continental European countries are similar to the German case or whether East and West German labour markets represent a mere outlier from an international perspective. A growing number of international studies documents that women are more engaged in household production than men and that time spent on housework activities adversely affects individuals’ wages. As is argued in this literature, spending time on housework activities constrains workers’ effort dedicated to market activities and flexibility thereby lowering their productivity and wages. As a consequence, the gendered nature of housework with women spending much more time on housework activities than men may contribute to the explanation of the gender pay gap found in the data. 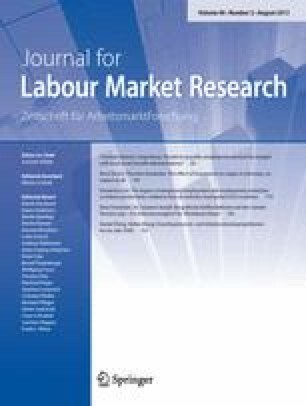 Whereas the vast majority of existing studies relies on data from Anglo-Saxon countries, this paper analyses the impact of hours spent on housework activities on individuals’ wages for Germany, a continental European country with very different labour market institutions and a much lower labour market attachment of women compared to Anglo-Saxon economies. We do so by using data stemming from two different data sources: longitudinal data from the German Socio-Economic Panel comprising the years 2000–2009 and cross-sectional data from the 2001/2002 German Time Use Survey. Whereas our descriptive results show that German women spend considerably more time on household activities than men, we find no evidence that wages are adversely affected by housework activities. This holds both for men and women, for married and single individuals, as well as for part-time and full-time workers both in West and East Germany. Notably, the robust absence of a negative impact of time spent on housework activities on wages is not driven by our attempts to address endogeneity concerns by applying instrumental-variables estimators, but also holds in standard OLS or fixed-effects wage regressions, where there are good reasons to think the coefficient of housework to be biased downwards. As the existing international literature has used comparable data sources and methods to arrive at its conclusions (e.g., longitudinal survey data, instrumental variables estimators, and, to a lesser extent, time use data), we do not think that different findings are due to methodological differences. In our eyes, the main difference is rather that existing studies documenting a negative impact of housework on wages has almost exclusively relied on data from Anglo-Saxon economies. Therefore, we think it would be promising to investigate whether other continental European countries are similar to the German case or whether the German labour market represents a mere outlier from an international perspective. Eine wachsende Anzahl internationaler Studien zeigt, dass Frauen verglichen mit Männern deutlich mehr Zeit auf Haushaltsaktivitäten verwenden und dass diese einen negativen Einfluss auf die Löhne ausübt. So wird in dieser Literatur argumentiert, dass auf Hausarbeit verwandte Zeit das für Marktaktivitäten verfügbare Anstrengungsniveau sowie die Flexibilität der Arbeitnehmer einschränke und somit zu einem Produktivitäts- und Lohnverlust führe. Entsprechend ließe sich aufgrund der ungleichen Aufteilung der Hausarbeitszeit zwischen Frauen und Männern ein Teil der geschlechtsspezifischen Lohndifferentiale erklären. Im Gegensatz zur überwiegenden Mehrzahl der vorhandenen Studien, die sich auf Daten aus angelsächsischen Ländern stützt, untersucht dieses Papier den Einfluss von auf Hausarbeit verwandter Zeit auf die Löhne für Deutschland, d.h. ein kontinentaleuropäisches Land mit erheblichen Unterschieden im institutionellen Rahmen und einer deutlich niedrigeren Erwerbsneigung von Frauen. Die Studie verwendet Daten aus zwei Quellen: Längsschnittdaten für die Jahre 2000–2009 aus dem Sozio-oekonomischen Panel und Querschnittsdaten aus der Zeitbudgeterhebung 2001/2002. Während unsere deskriptiven Analysen zeigen, dass deutsche Frauen verglichen mit Männern deutlich mehr Zeit auf Hausarbeit verwenden, so finden wir jedoch in unseren Regressionsanalysen keine Anzeichen, dass Hausarbeit einen negativen Einfluss auf die Löhne ausübt. Dies gilt sowohl für Frauen wie Männer, für verheiratete wie ledige Personen, als auch für Teilzeit- wie Vollzeitbeschäftigte in West- und Ostdeutschland. Zu beachten ist, dass die robuste Abwesenheit eines negativen Hausarbeitseffekts auf die Löhne nicht von unseren Versuchen getrieben ist, die etwaige Endogenität von Hausarbeit in den Lohnregressionen durch Nutzung von Instrumentvariablen zu berücksichtigen. Dieselben Ergebnisse zeigen sich auch in gewöhnlichen KQ- sowie Fixe-Effekte-Regressionen, in denen gute Gründe zu der Vermutung bestehen, dass der Hausarbeitskoeffizient nach unten verzerrt sein könnte. Da die vorhandene internationale Literatur ihre Erkenntnisse auf Grundlage ähnlicher Datenquellen und Methoden (z. B. longitudinale Befragungsdaten, Instrumentvariablenschätzer und, zumindest teilweise, Zeitbudgetstudien) gewonnen hat, denken wir nicht, dass sich die unterschiedlichen Ergebnisse zwischen dieser Arbeit und der bisherigen Literatur auf methodologische Unterschiede zurückführen lassen. Vielmehr vermuten wir, dass der Hauptunterschied darin zu sehen ist, dass das Gros der vorhandenen Literatur, das einen negativen Einfluss von Hausarbeit auf Löhne findet, auf Daten aus angelsächsischen Ländern beruht. Vor diesem Hintergrund erscheint es uns lohnenswert zu untersuchen, ob sich ähnliche Ergebnisse wie für Deutschland auch für andere kontinentaleuropäische Länder finden lassen oder der deutsche Arbeitsmarkt aus internationaler Perspektive vielmehr als ein Ausreißer zu betrachten ist. For a recent survey on the existing theoretical and empirical literature on the effect of housework on wages we refer to Maani and Cruickshank (2010). For empirical analyses finding a negative impact of wages on hours allocated to housework activities we exemplarily refer to Hersch and Stratton (1994) for the U.S. as well as Gwozdz and Sousa-Poza (2010) for Germany. The latter paper also includes a comprehensive review of the empirical literature on this issue. As pointed out by a referee, housework may affect wages with a lag rather than immediately, in particular in heavily regulated labour markets like Germany as opposed to less regulated ones like the U.S. To check this, we also fitted (in the GSOEP sample where we have information on past housework activities) wage regressions including lagged rather than contemporaneous hours spent on housework. This yielded qualitatively similar results to the regressions including current housework as regressor. As suggested by a referee, rather than analysing along the married–single distinction it may be more interesting to assess whether housework has a different impact on the wages of individuals with and those without children. To check this, we re-did the following analyses distinguishing individuals with and without children, which did not change our insights. We follow Bryan and Sevilla-Sanz (2010) in using actual rather than potential experience, i.e. total cumulated working experience from full-time and part-time work. Using potential experience instead does not change our results. Although our instruments are standard in the literature, we are aware that some endogeneity may still exist even after instrumenting housework. For example, we cannot rule out that idiosyncratic wage shocks unrelated to changes in observed covariates induce the individual to move to a bigger place, so that the rise in housework following the move may be endogenous with respect to wages and FE IV regressions may still suffer from endogeneity. Unfortunately, our data sets do not contain other credible sets of instruments to investigate this issue further. In particular, other standard instruments used in the literature like spouses’ characteristics are not available when including single individuals in the analysis as we do. For details on the GSOEP we refer to Wagner et al. (2007). For details on the GTUS, see Federal Statistical Office (2005) or Ehling et al. (2001). In consequence, we drop individuals with hourly gross wages below €1.92 or above €43.15 as well as individuals who report to spend more than 60 hours a week on housework activities. Note that considering married individuals in a strict sense only, i.e. excluding cohabiting individuals from our analyses, does not change our conclusions. Note that running separate regressions for full-time and part-time workers (instead of including just an interaction term of hours spent on housework with part-time work) does not change our insights, though this poses the problem of very small sample sizes for some subgroups like part-time working single men. For this reason, we decided to run pooled models including the interaction of housework and part-time work rather than separate models by employment status. Another estimation issue that could influence our results is sample selection into employment as we do only observe wages for working individuals. Particularly for women, for whom participation rates in Germany are rather low compared men and also quite different in West and East Germany (Hanel and Riphahn 2011), this may be relevant and may also explain the different findings for West and East German women in our GSOEP sample. To assess whether our results are influenced by selectivity, we applied several two-step control function estimators: In our GSOEP sample we used the estimators proposed by Wooldridge (1995), which intuitively adds a sample selection correction term to the standard FE model, and by Semykina and Wooldridge (2010), which does the same in the IV FE model. In our GTUS sample, we made use of a standard Heckit and a Heckit IV model (for the latter, see Wooldridge 2010, pp. 809–813). As exclusion restrictions we added the individual’s age (linearly and squared), a dummy indicating health problems, and the total household income (excluding the individual’s own income) to the first-step employment equations. While we cannot reject selectivity in many cases (in particular for women selectivity correction terms have significant coefficients in most wage regressions), the impact of hours spent on housework on wages remain qualitatively the same as before, with the exception of East German women in our GSOEP sample for whom the negative housework effect disappears. Note that our results do not change qualitatively when excluding hours spent on “childcare” and “care and support for persons in need of care” from the “routine housework” category and adding these as a third category of housework activities to the wage regressions. We would like to thank Claus Schnabel, two anonymous referees, and the editor of this journal for very helpful suggestions. We also appreciate the comments received from participants of the 4th Ph.D. workshop of the Institute of Employment Research in October 2011.